I grew up right in the heart of the Twin Cities. That’s in Minnesota, don’t-chya-know? Back in the day, before it was bought out by Macy’s, Dayton’s department store was a happening place to be. There was a restaurant located inside this Dayton’s (which eventually became Marshall Field’s), and on occasion when my sister and I would spend the weekend with my grandparents, we’d take the city bus to downtown St. Paul, and have lunch at Dayton’s restaurant. If we were really good, we got to go to the candy counter and pick out 1 or 2 suckers. They had the best suckers. They were rectangle shaped, and took forever to finish. Ahh, those were the days. Because of the fond memories I have of taking the big city bus to eat tasty lunches with my grandparents at “the fancy department store”, and of getting candy treats from a ginormous candy counter, Dayton’s has long since been a place that I liked to spend time. Even if I’m not shopping for anything. As the years passed, Dayton’s got rid of their restaurants and turned that section of their stores into a “Market Place”. They sold kitchen ware, cookware, bakeware, dishes, gadgets, cutlery, gourmet and specialty foods, fancy frosted cookies, artisan candies, and they featured a deli. You could buy soups, wraps and salads. Not as fun as siting in the corner booth of a restaurant and melting into an old childhood memory, but the food was good, and the section where people ate was oftentimes quiet, so it became my go-to place to visit when I needed to decompress from life, or just felt nostalgic for the fond memories of childhood. One day during an outing to the Market Place, I went to order some lunch. Just a quick bite that would carry me over until dinner. They were out of the pasta dish I typically ordered, and at the urging of the gal behind the counter, I tried this creamy, sesame-soy flavored pasta salad with chicken, bright green snow pea pods, button mushrooms, crispy wonton strips and juicy mandarin oranges. Um, yeah. I was sold! It was as delicious as it was pretty. So many textures, it was salty, sweet, crispy, creamy, soft. It was perfection in a little deli cup. One day shortly after switching to real food, I was out running errands I decided that I wanted to try to recreate this pasta salad at home. I ran to Macy’s, got small container of this salad to go, and ran home so I could begin the tasting, and measuring, and trial and error. Because it took me a few days of running around the Twin Cities to ultimately find the right noodles, I made my first test batch of this recipe with cavatappi noodles. Aside from spaghetti noodles, those are probably my second favorite noodle. I just love them in hot or cold pasta dishes. My first attempt at the dish was good, but it wasn’t perfect. I think it needed those special noodles. The Stud Muffin (TSM) would argue that all pasta tastes the same, but I beg to differ. I think different shapes taste different. Some taste more pasta-y than others. The cavatappi worked fine, but they were almost too substantial. This dish required a more delicate pasta with a similar shape. Macy’s used these long, adorable spiral noodles- that were nothing like those rotini or corkscrew shaped pastas. These looked like an old telephone cord. Sorta. Anyway, I finally found THIS brand at a local high-end grocery store chain. Score! With my fancy noodles in hand, just like the ones used in the recipe, I went back home and tried this dish a second time. Armed with the ingredient/price label from my deli container, I worked out which ingredients I figured made up the “sauce” and which did not. Figuring out ratios and measurements came next. After a couple of hours I had it! It tasted SO good. There is something about recreating a dish you love from a restaurant or cafe. It almost tastes better because you were able to make it without a recipe. Gah! No. I did not know that. The thought didn’t even cross my mind. I went to my computer, typed in a few key words into the almighty wizard of Google, and viola- the recipe. You’ve gotta be kidding me! I could have saved LOTS of time and ingredients had I just done a basic internet search. Oh well. Live and learn. You’ll be tickled to know that my recipe was ALMOST spot on with the one that I found online. It’s like a super power or something. Maybe I was attacked by low-level microwaves while experimenting in the kitchen one day, and I was nicked by a rogue piece of pasta and I now have the ability to recreate recipes without the original recipe using only the ingredients, and having it be darn near identical to the original recipe. I’m sure that’s it. I’m a super hero. ‘Bout darn time, too. Geesh. This is one of my go-to hot weather dinners. Since moving down to South Carolina, my list of “It’s too hot to cook” meals is quickly growing. Thankfully! When you’re too warm to eat anything heavy, but you want something nourishing, this is a great dish. Anything that has veggies, fruit, protein, fat and a little carb is good in my book. It doesn’t take long to put together if you spend a little extra time getting your Mise en Place together (prep everything first). 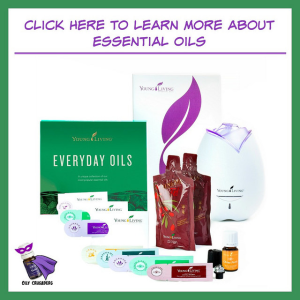 There are few steps, but they are all very easy steps. 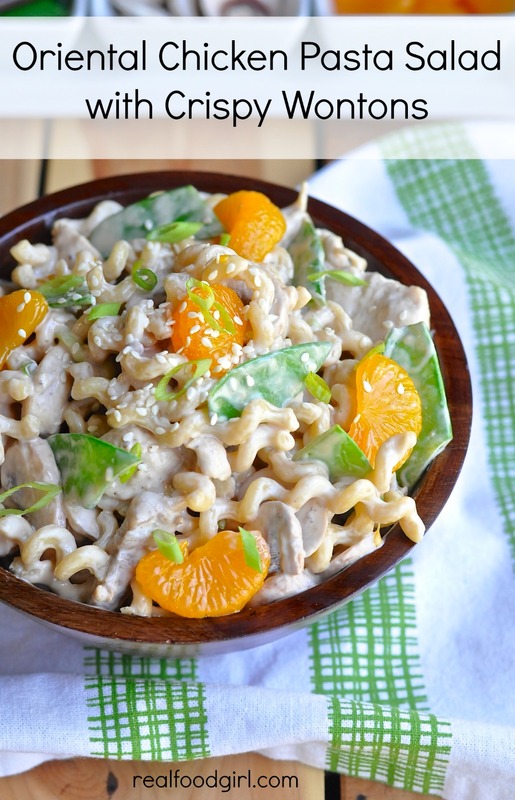 Asian Chicken Pasta Salad isn’t a heavy pasta salad. It’s not mayo based, but its dressing is similar to a mayo in that it uses an egg yolk. I use only pastured, local eggs so I am completely fine with eating a dressing that contains a raw egg yolk in it. I wouldn’t be caught dead trying this with a grocery store egg, even if it had been pasteurized AND irradiated. But that’s just me. In an article on eggs that I wrote, but have yet to post on the blog, I spent hours- countless hours- researching egg labels. As a result, I now only buy pastured eggs from a local farm. These chickens roam free, eat bugs, worms, other critters- and best of all, they are not forced to eat a vegetarian diet. Chickens aren’t vegetarians. But that’s another post for another time. 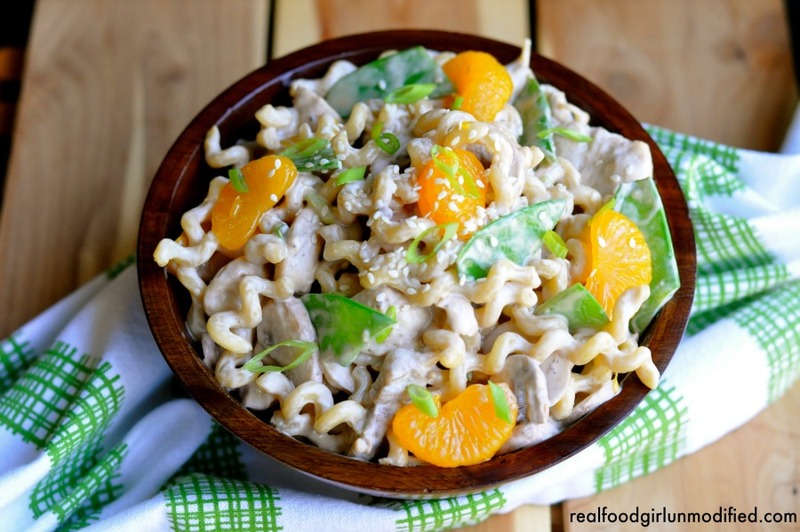 If you want to spice up your weekday lunch, add something fun to your side dish line up, or you just want something light and simple for dinner, you NEED to try this pasta salad. It will keep in the fridge for a few days. The pea pods start to lose their color a bit, and the oranges start to get mushy, but other than that, you’ll have more than enough left over wonton strips and some left over dressing, so you can redress it, add the crunchies and go to town. 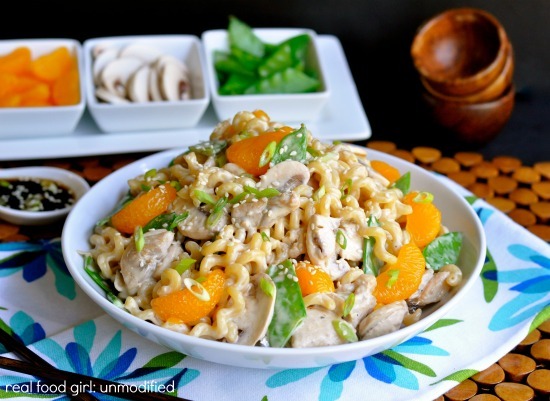 A crowd pleasing non-mayo based Asian inspired pasta salad with fresh veggies, crispy wonton strips and juicy mandarin oranges. In a blender or food processor add the egg yolk, honey,sugar, soy sauce, rice wine vinegar and white pepper, process to combine, then with motor running slowly add sesame oil and olive oil Dressing should be thick. Chill dressing while you finish prepping the rest of the dish. In a large pot of boiling salted water cook the pasta to al dente. Drain and cool. Drain and set aside. 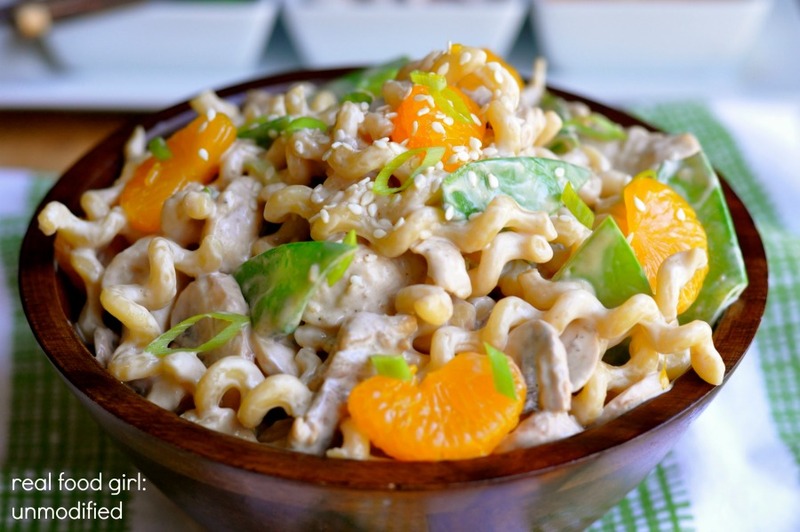 In a large mixing bowl toss together the chicken, pasta, pea pods, green onions, and mushrooms. Chill. In large bowl, combine cooked, drained and rinsed pasta, cooked chicken, pea pods, onions and mushrooms. Toss gently. Pour dressing over mixture and toss to coat. Add salt and pepper to taste. Chill well. Before serving, prepare won ton skins. Slice won ton skins into 1/4-inch strips and fry in tallow, lard, coconut oil or organic palm shortening, oil heated to 350 degrees, until crisp. They will brown in 30 to 60 seconds. Remove with a slotted spoon or spider and drain on a paper towel. Set aside. Remove oil from heat. Blanching Pea Pods: In a medium pot of boiling salted water, carefully add the uncut pea pods. Boil for 30-60 seconds until they start to puff up and rise to the top. With a large slotted spoon or spider, remove and immediately place the pea pods into a bowl of icy water. Remove from icy water once they are fully cold. Dry on a paper towel and set aside until ready to add to the salad. Garnish the finished salad with the oranges, toasted sesame seeds, and the fried wontons. Serve and enjoy! The oranges start to break down after this sits in the fridge overnight, so we add them as a garnish with the wonton crisps. Save the extra dressing for leftovers. If you don't have any leftover chicken on hand to use in this recipe, simply do the following: In a large skillet, cook sliced pieces of chicken breast and/or thigh, seasoned with salt and pepper until cooked through. I use 1 breast and 2 thighs. Once cooked, strain/drain and set aside until cooled and ready to add to the salad. Yummy I can’t wait to try this!! This looks incredible and your food photography is beautiful! Thanks! It’s so tasty!! I can’t get enough. I love Asian inspired foods! Looks yummy! I adore chinese food, so this is right up my alley. Maybe I’ll try an at home dish next time I crave it instead of going out! This looks delicious, and I love main dish salads for the summer time. This looks yummy! I like all kinds of asian foods. Love the unique pasta shape. Oh that looks so good! I’ve been on a kick with Asian food lately &this is going on my meal plan for next week! You’ll have to let me know what you guys think. I love Asian food, too! Anything Asian inspired and I’m all over it! !